Don't be shy - Owner wants it sold - bring all offers! The best Penthouse views in all of Meridian! Experience the luxurious Florida lifestyle with gorgeous open views that encompass Casey Key, Siesta Key, Downtown Sarasota, Little Sarasota Bay & the Gulf. This private, rarely available corner residence is located in a fabulous gated community offering the best in luxurious living. An elevator leads you to a private foyer appointed with marble floors & a bright & elegant interior that has been professionally decorated with no expense spared. Well appointed with custom silk draperies, plantation shutters, gleaming hardwood floors, soaring 10 ft ceilings, crown molding, 2 new A/C units & more. The remodeled open concept kitchen features warm wood cabinetry, stainless steel appliances, tray ceiling, & breakfast bar that overlooks the spacious living area with captivating views. Open the 4 panel sliders & enjoy gorgeous sunsets from the expansive lanai with roll down shutters. This exceptional residence also includes a separate dining room, 2 car garage attached, & hurricane resistant doors & windows. Nestled behind the gates of The Oaks Preserve directly on Little Sarasota Bay. 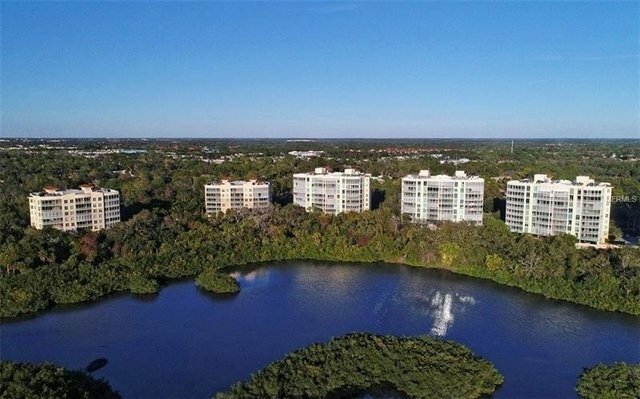 Owners enjoy a secure lobby, pool, fitness center & a convenient location close to Sarasota's award-winning beaches, dining, shopping, boating, & state parks. Located in the beautiful golf community of The Oaks which offers two 18 hole courses, 12 Har-Tru tennis courts, croquet, clubhouse & dining. Oaks Club membership required.